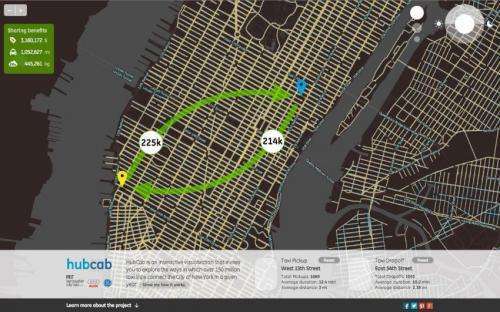 Screenshot of HubCab showing taxi flows and potential taxi-sharing benefits between two locations in Manhattan. Credit: HubCab, MIT Senseable City Lab. Authoritatively answering that question requires analyzing huge volumes of data, which hasn't been computationally feasible with traditional methods. 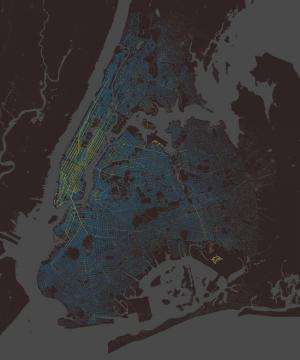 But in today's issue of the Proceedings of the National Academies of Sciences, researchers at MIT, Cornell University, and the Italian National Research Council's Institute for Informatics and Telematics present a new technique that enabled them to exhaustively analyze 150 million trip records collected from more than 13,000 New York City cabs over the course of a year. "Of course, nobody should ever be forced to share a vehicle," says Carlo Ratti, professor of the practice in MIT's Department of Urban Studies and Planning (DUSP) and one of the paper's coauthors. "However, our research shows what would happen if people have sharing as an option. This is more than a theoretical exercise, with services such as Uber Pool bringing these ideas into practice." Finding the optimal combination of trips does require foreknowledge of trips' starting times: For instance, a 30-minute trip the length of Manhattan might be combined with a 10-minute trip beginning 15 minutes later. But that kind of advance planning is unlikely if the passengers are using cellphone apps. So the researchers also analyzed the data on the assumption that only trips starting within a minute of each other could be combined. Even then, they still found a 32 percent reduction in total travel time. 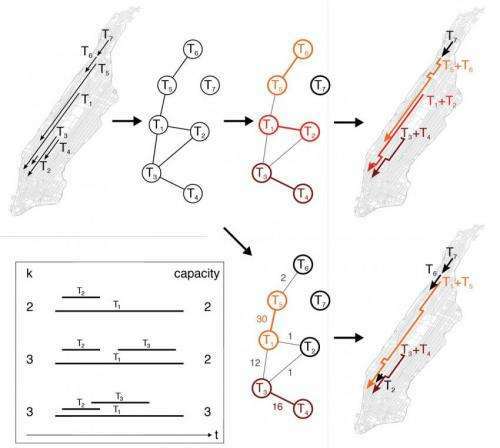 Shareability networks translate spatiotemporal sharing problems into a graph-theoretic framework that provides efficient solutions. Credit: Paolo Santi and Michael Szell. "We think that with the potential of a 30 percent reduction in operational costs, there is plenty of room for redistributing these benefits to customers, because we have to offer them lower fares; to drivers, because we have to incentivize them to belong to this system; to companies; and of course, there is a benefit for the community," says Paolo Santi, a visiting scientist in DUSP and first author on the paper. In fact, Santi says, the results of his and his colleagues' analysis were so striking that they asked Cornell mathematician Steven Strogatz to review their methodology. Strogatz is a co-author on the paper, as are Ratti and postdoc Stanislav Sobolevsky, both of MIT's Senseable City Lab. Rounding out the author list are Michael Szell, who was a postdoc in the Senseable City lab when the work was done and is now at Northeastern University, and Giovanni Resta, a researcher at Santi's home institution, the Institute for Informatics and Telematics. Screenshot of HubCab showing pickups and dropoffs of 150 million taxi trips over one year in New York City. Credit: HubCab, MIT Senseable City. In analyzing taxi data for ride-sharing opportunities, "Typically, the approach that was taken was a variation of the so-called 'traveling-salesman problem,'" Santi explains. "This is the basic algorithmic framework, and then there are extensions for sharing." The traveling-salesman problem asks whether, given a set of cities and the travel times between them, there is a route that would allow a traveling salesman to reach all of them within some time limit. Unfortunately, the traveling-salesman problem is also an example—indeed, perhaps the most famous example—of an NP-complete problem, meaning that even for moderate-sized data sets, it can't (as far as anyone knows) be solved in a reasonable amount of time. So Santi and his colleagues took a different approach. First, they characterize every taxi trip according to four measurements: the time and GPS coordinates of both the pickup and the dropoff. Then, for each trip, their algorithm identifies the set of other trips that overlap with it—the ones that begin before it ends. Then it determines whether the trip they're examining can be combined with any of those other trips without exceeding the delay threshold. On average, any given trip is "shareable" with about 100 other trips. Next, the algorithm represents the shareability of all 150 million trips in the database as a graph. A graph is a mathematical abstraction consisting of nodes—usually depicted as circles—and edges—usually depicted as lines between nodes. In this case, the nodes represent trips and the edges represent their shareability. The graphical representation itself was the key to the researchers' analysis. With that in hand, well-known algorithms can efficiently find the optimal matchings to either maximize sharing or minimize travel time. Many small towns already have this system working as "Dial-a-ride" bus. "Their conclusions: If passengers had been willing to tolerate no more than five minutes in delays per trip, almost 95 percent of the trips could have been shared." What percentage of taxi riders are willing to share? Of those willing to share what percentage are willing to be delayed? Can you retract your willingness to share? Retract it based on appearance?